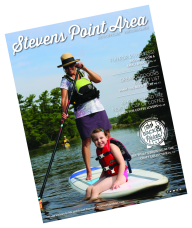 Learn more about the Stevens Point Area, including some of the region’s facts and figures, including population, accolades, weather and more. Covering more than 800 square miles in Central Wisconsin, most of the county is rural offering year-round recreational opportunities, dotted with small communities. When Stevens Point was first founded in 1858, the logging industry and trading posts defined the location. With help from the Wisconsin River, the railroad, and rich soil, the area continued to prosper. Now, the region is home to 27 municipalities with a population of over 70,000. The world’s largest trivia contest, hosted each April by the University of Wisconsin-Stevens Point, WWSP-90FM calls the region home. Hundreds of teams compete in the 54-hour event that has been featured on Jeopardy. World’s largest and longest running renewable energy event, the Renewable Energy & Sustainable Living Fair is hosted in Custer, is held each year on the third weekend in June in the Stevens Point Area. The region has lots of ties to conservation legacy, from the giant iconic ‘Sand County Bench’ on display in the Stevens Point Sculpture Park to the nation's first conservation education major created in 1946 and formed into the College of Natural Resources in 1970 at the University of Wisconsin – Stevens Point. The first ever refrigerated salad bar, which debuted at the Sky Club in the 1950’s. The iconic supper club is still in operation today in Plover. Patrick Rothfuss widely known author and has roots in the region as an University of Wisconsin Stevens Point alumnus. His 2011 book The Wise Man's Fear reached Number 1 on the New York Times Hardback Fiction Best Seller List and he is currently working with Lin-Manuel Miranda on the adaptation of the Kingkiller Chronicles. Kathy Kinney, most well-known for her role on the Drew Carey Show as “Mimi” was born and raised in Stevens Point. Lee Sherman Dreyfus, once governor of Wisconsin, lived in Stevens Point during his period in office as University of Wisconsin – Stevens Point Chancellor. Today, the university center on campus bears his name. Stevens Point Area sports ties include; current San Jose Sharks player Joe Pavelski, born and raised here, Jordan Zimmermann, a pitcher in the major league who has played for the Detroit Tigers and the Washington Nationals who spent his college days at the University of Wisconsin Stevens Point and former California Angels star, Rick Reichardt, who lived in Stevens Point from 3rd grade on. Watch the Disney channel? The show Liv & Maddie is set in Stevens Point, Wisconsin, even though it isn’t filmed here. Peter Weller, known for his role as Robocop, was born in the Stevens Point Area. The oldest farmers market in the state of Wisconsin is still operational in downtown Stevens Point. 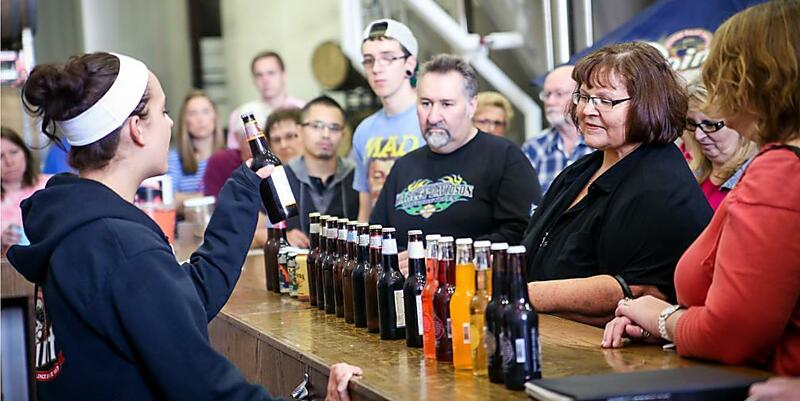 The Stevens Point Brewery provided beer to Union troops during the Civil War and survived prohibition. 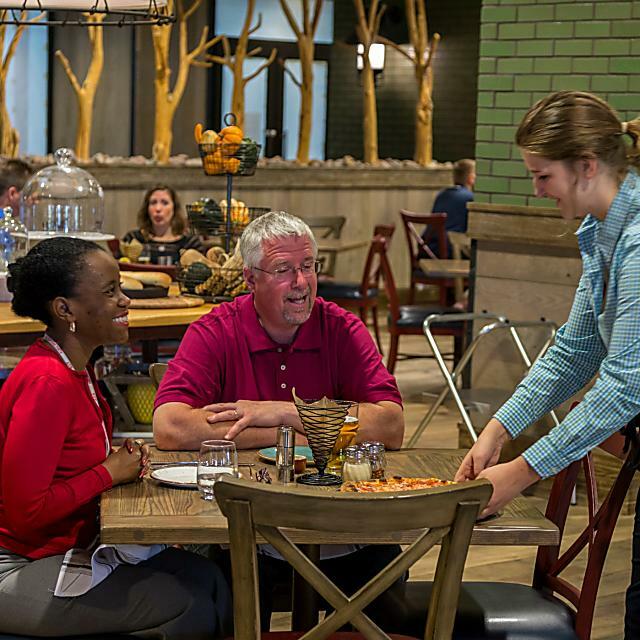 This local landmark started brewing in 1857, a year before the city of Stevens Point was founded. UW-Stevens Point’s nickname is the Pointers. The school’s mascot: a dog nicknamed Stevie. Check out the ‘Pointer Dog Sculpture’ by artist August Kochanowski, not far from the massive mosaic mural on the Trainer Natural Resources Building. Portage County has two fairs: one in Amherst in July; a second in Rosholt on Labor Day weekend. Every spring, people flock to the Buena Vista Grasslands to see the prairie chicken – a threatened species. The Winter Thunder Club races cars on Lake DuBay every winter – until the ice melts.